Jusssstttt got back from dinner at Mercat. The reason was this. We ordered every savory dish on the special menu by the two guest chefs (12ish) + razor clams with bacon vinaigrette and brussel sprouts. A lot of food and wine as usual. Nothing to write home about really and especially since my favorite was the razor clam dish which came from the regular menu. By the end of it I was just really hungry for real tapas…pan con tomate, sizzling shrimp in garlicky olive oil, boquerones, bacalao fritters, you name it…argh!!! For your reference, I was in Spain about a month ago (hence all this Spanish craze). 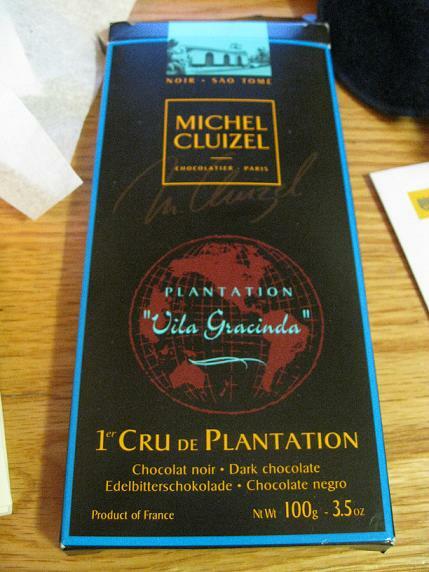 We had a layover at Charles de Gaulle and that’s where I picked up all these Michel Cluizel bars for cheap! This one pictured above is my favorite so far (Noir – Sao Tome) – smoky and spicy with loads of character or as the back panel described it, “[the beans] make this highly aromatic chocolate, whose exceptionally long taste combines toasted, spicy and herbaceous notes with flavours of ripe tropical fruits and liquorice sticks.” And that long taste bullcrap, YOU’LL KNOW EXACTLY WHAT THEY MEAN AFTER YOU TASTE IT! So I got home, took a pee (because my bladder was exploding!) then got right to business. Here’s the deal: Amy’s sourdough bread toasted and slathered with olive oil, cut it up and top each with a square of the aforementioned chocolate, then broil and finish with a sprinkle of sea salt. YUM YUM YUM! I had four pieces of those. With a glass of sherry. After a 4-hour dinner. I’m a pig, and damn proud of it.